Flow cytometry is a powerful technology for investigating many aspects of cell biology and for isolating cells of interest. Flow cytometry utilizes highly focused, extremely bright beams of light (usually from lasers) to directly reveal aspects of cells - e.g size and granularity - by the way light is scattered or indirectly by attaching fluorescent probes to cell components e.g DNA binding dyes or labeled antibodies. 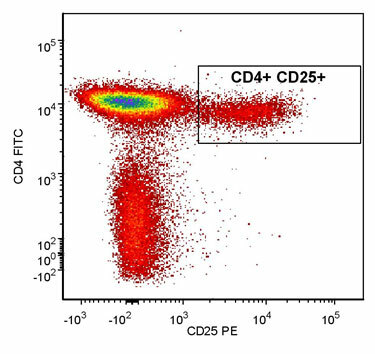 The power of flow cytometry derives from the fact that it quantitatively analyzes individual cells, thus permitting the identification of subpopulations within a sample. The power of single cell analysis is compounded by the ability to measure multiple parameters simultaneously on each individual cell, to do this very fast (in excess of 20,000 cells/second), and to isolate/purify/sort desired subpopulations (up to 4 simultaneously).